Share the post "The Same Sleeping Bag"
It was terribly refreshing to see the sun finally shining today. I was beginning to think it had abandoned us for another solar system. When I was driving along Birch Drive earlier, I just happened to get a glimpse of a hen turkey with a handful of smaller ones near the roadway. They made me smile when watching them in how the young ones seem to stay so close to their Mamma in spite of the darting back and forth looking for something to eat. Someone told me not long ago that the more wild turkeys we see, the fewer pheasants there’ll be. I was brought up to speed when told they compete for the same nesting areas as well as food, so with the turkeys being larger, you don’t have to ask which ones get the best seats in the house. We seem to be able to draw parallels with human behaviors and wild animals’ where might make right, along with the survival of the fittest. I only hope some of bad habits of the humans aren’t being rubbed off onto the animal kingdom. A handful of them have already adapted to City life and some continue working at taking up residence in our homes. I’m still wondering why there hasn’t been a mad scientist who’s created hand gloves and foot gloves similar to the claws on squirrels. The gloves could have computer sensors in them to where the claws would extend and contract by the muscle pressure exerted by a person’s hands and feet. Can you imagine being able to hang upside-down on a tree trunk, or crawl up anything that you can get your claws into? Move over cliff climbers and make room for the tree scalers and pole climbers. Most of my morning was spent getting a home listed which is located at 850 – 15th St. SE here in Mason City. It’s been in one particular family likely since it was built. There’s been the usual updates including newer furnace, central air, permanent siding, and thermal windows. The kitchen appears to have been updated since the home was built along with the installation of a dishwasher and garbage disposal. The basement offers a ¾ bath and an open space that could be converted into a man cave. All the appliances stay including the washer and dryer. Any first time buyers in our market should jump at the chance to own this home. What I found attractive about this homesite is the size of the lot to where one could add another attached garage stall. There’s a covered patio out back which would be a great place to spend summer evenings without getting soaked when a rain storm suddenly arrives. At the rear of the lot, there are about four absolutely gorgeous white pine trees. The owner informed me that one of those trees is the nesting site for a pair of red-tail hawks who arrive every year to raise their young. Curious me had to go looking for the nest. I happened to see it about two thirds of the way up the tree. All I could say was, “Wow! That’s one big nest!” And to think they instinctively return to create another generation. 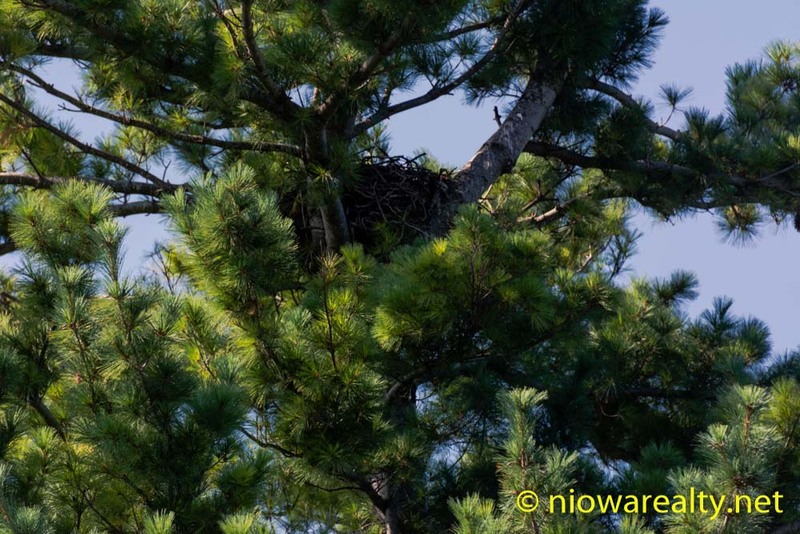 The above photo is of that particular nest while at their home. My late afternoon wasn’t the most delightful after receiving a call from a dear friend telling me some of the monstrous things several people are trying to do to her. I think I got her calmed down, and before I hung up I jokingly said, “The next time you talk to them, think of the most evil person we all know and say, “It appears when you take your dirt naps, you’ll be sharing the same sleeping bag with that so-and-so.” which may cause them to step back and realize how evil they’ve become.” She laughed and said, “If I think of it the next time, I’ll be sure to say it.” It sure takes all kinds doesn’t it?